At a time when managers everywhere are seeking strong but sensible ways to reorient their companies for the coming millennium, a new edition of Reframing Organizations: Artistry, Choice, and Leadership, by Lee Bolman and Terrence Deal, reintroduces the bestselling authors' clear and insightful approach to "big picture" management. Updated examples add to those previously drawn from business, education, health care, and the public sector to help today's leaders prepare more creatively for tomorrow's needs. In this updated version of their best-selling classic, the authors explain how the powerful tool of reframing --appraising situations from diverse perspectives--can be used to build high-performing, responsive organizations. 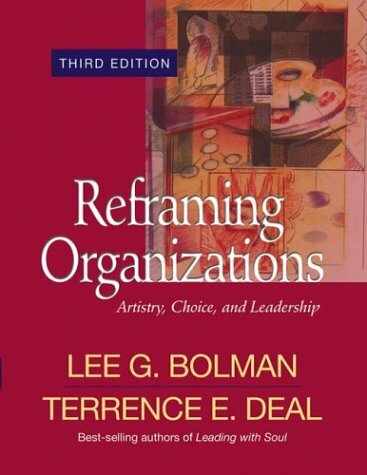 The fact that Reframing Organizations is often used as a university textbook should be a subtle warning that this is not a quick-read or how-to book. However, it is THE overview of the broad practice of organizational theory. Bolman and Deal utilize models based on four different views of the organization to show how to analyse and comprehend the dynamics of organizational structure and function. As a software engineer I found this "multi-model view to understanding" similar to how we model software systems from a variety of perspectives. Often when a book focuses on two distinct audiences (in this case, managers and students - future leaders as the authors say) it fails to satisfy either. Not the case with this classic, as it does a good job of providing a large body of theory and it makes the reading interesting and useful for a practitioner. The four organizational viewing frames - Structural, Human Resources, Political, & Symbolic - help the process of making a textbook readable, but the straightforward writing style, story examples, and real-life illustrations keep it alive, and maybe even keep the student reader awake. The book looks at organizations and organizational performance/effectiveness using four frames (essentially tinted looking glasses)- structural, human resources, political and symbolic. We used the book in our first MBA course, with a primary focus on high performance teams. Fast shipping, great condition, thank you!!! I just started management school and this is the first book I had to read. I must say that if nothing else, this book was enlightening! I really liked the way the author broke down any given corporate scenario in 4 different viewpoints. Personally, I really liked the HR Frame, followed by Political Frame. Those two were the ones I really thought helped me at my work place. The Structural frame, I thought was kind of boring.....nothing to really look forward to. The Symbolic frame really talks about corporate culture; something half the corporate world never thinks about any more! Wont be bad if you have to read it for your MBA! Reframing Organizations is very good!